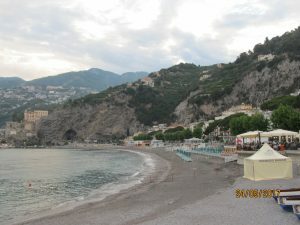 Our first morning on The Almalfi Coast was a pretty one, 22C, sunny with a little breeze off the Tyrrhenian Sea. So coffee and tea on the patio, Perfect! Later, out and about the town we went for a nice walk. 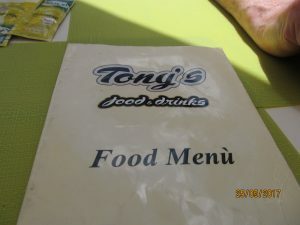 For lunch/brunch we dropped into Tony’s Food and Drinks right on main street across from the beach. We could see that the locals were eating there so this looked like a good bet for food. I ordered the chicken panini sandwich and Hubby had an omelette on ham and cheese toast which seemed a little different. However it was very tasty and the portions were very generous. The food was fabulous and with a couple of very cold beers, brunch came to 23 Euros total. It was a very nice lunch indeed. Thank you Tony! Out For Brunch & Walk along the Maori Boardwalk! 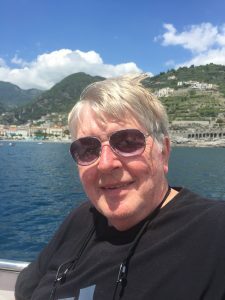 We were interested in visiting the Isle of Capri. 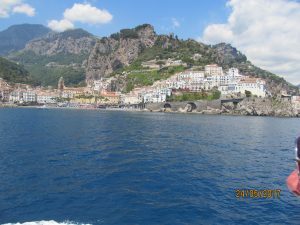 So we took a boat for 8 Euros each over to the Town of Almalfi which is the jumping off point for ferries over to Capri. 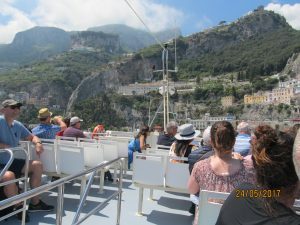 We discovered that there were only whole day tours being offered over to Capri from Almalfi, leaving at 8:30 AM and returning at 6:30 PM. The line-ups were crazy and we decided that we were not going to commit to a whole day for Capri. 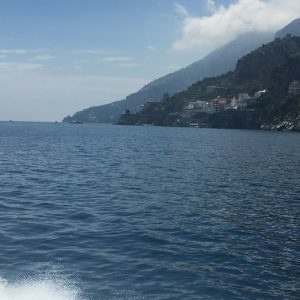 This would have also meant that we would have had to start very, very early the next morning to get a boat from Maiori over to Almalfi in order to catch another boat to Capri. The prices of the tours were really outrageous as well. Taking the Boat to Almalfi! 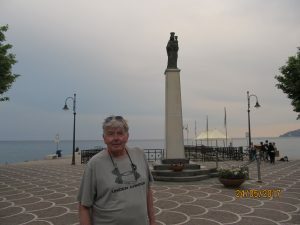 We had a couple of hours to explore Almalfi before catching the Travelmar boat back to Maiori. Almalfi is a very, very busy place, much busier than Maiori. So much traffic and congestion! Tour buses parked in places you couldn’t get around and car traffic was unbelievable. 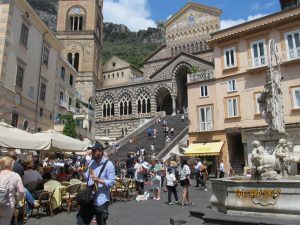 There were lots of tourists congregating here to catch ferries to Salerno and Positano and other towns that dot The Almalfi Coast. Of course there was also the boat traffic back and forth to Capri. 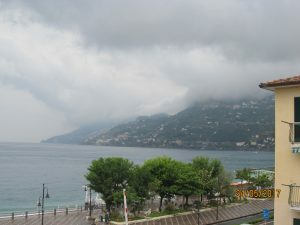 We were so glad that we had picked Maiori over Almalfi as a place to stay. The crowds were actually very stifling in Almalfi! We dropped into a harbour front bar and patio for a couple of cold beers on this very sunny day! It was amazing to see how many people were there wandering the streets and the number of tour buses parked on the main road and off the main road was astounding. A mad house of activity. None the less we had found a nice place to enjoy the chaos from comfortable chairs at a harbour front bar! 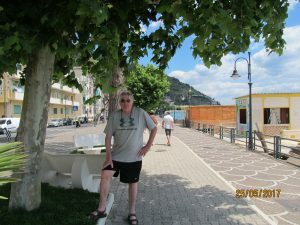 Taking a Walk in the Town of Almalfi! 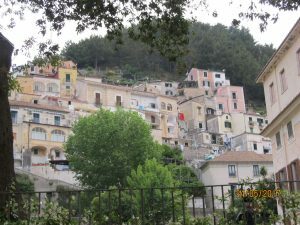 After drinking our beers and taking in the harbour front scenery, we decided to take a walk about Almalfi which is as you might guess a very hilly place, with houses built all along and into the mountain sides. We wandered up a few of its historic streets and I must say the scenery was quite striking. 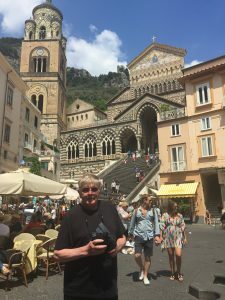 We visited an old church that was built into the side of an impressive hill and browsed some of the local stores which carried many lovely garments, linens, and souvenirs. We stopped again as the heat was quite stifling. By this time it had become quite hot and sunny and shade was a necessity. After another pit stop we headed back towards the harbour front, making our way back at our own leisure in the hot sun of the day! Our boat back to Maiori departed on schedule at 4:10 PM. 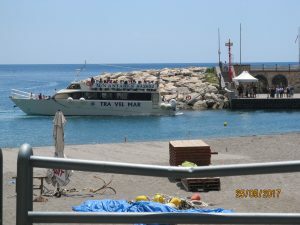 Travelmar operates varying sizes of boats on several different routes along The Almalfi Coast. So you have to pay particular attention to ensure you are lined up for the right boat. 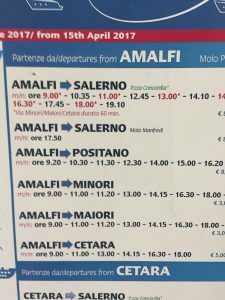 There are up to four or five different boats leaving Almalfi within 10 minutes or so for different destinations. The signs are not well marked as well. 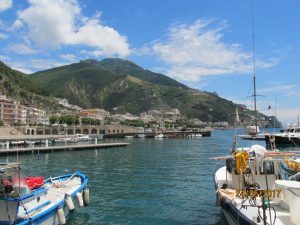 Our boat could accommodate about 30 people and was a fast boat taking only 30 minutes back to Maiori, with one stop at Minori. 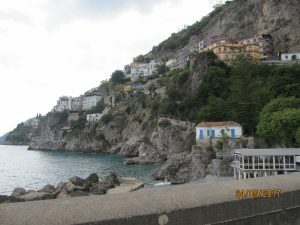 The Almalfi Coast looks even more amazing and beautiful looking at it from offshore, with dramatic cliffs, colourful houses scattered along the hillsides and lots of fruit trees growing up and down the mountain valleys! So, so Beautiful!! 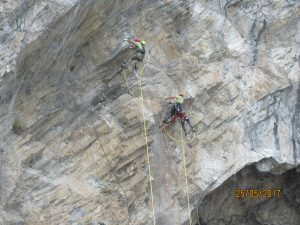 Workers on the Cliffs of Maiori Trying to Widen the Roadways by Blasting & Drilling the Cliffs! The weather was perfect for a boat ride at 23C and very sunny. Unlike Newfoundland you didn’t need a heavy coat or sweater for a ride on the ocean. Hubby was in his glee!! 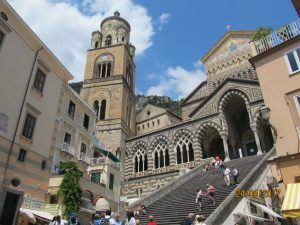 We were back in Maiori by 5 PM. Some interesting construction was taking place above the traffic clogged Almalfi Coast on Route Strada Stale 163 which is just next to where our boat landed and let us off. 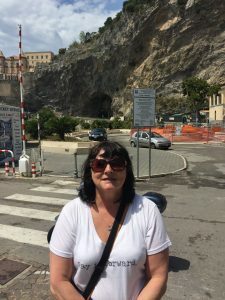 As we walked back up from the harbour pier in Maiori we could clearly see the construction that was taking place and it was amazing and breathtaking! 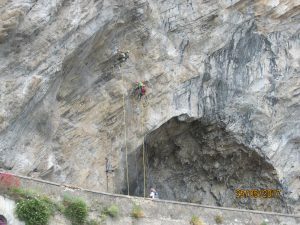 There were several guys hanging on ropes on the cliffs above the road drilling holes for explosives in the cliffs which would be detonated at sometime. 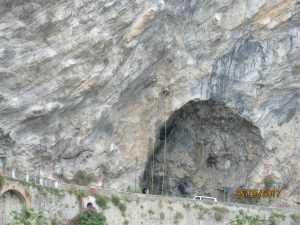 There is a constant program underway to widen the coastal highway and they are blasting away the roadside cliffs, which was very noisy and looked pretty dangerous for the workers! Very interesting though! 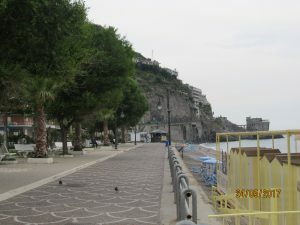 Our Walk Back From the Marina in Maiori to the Hotel Pietra Di Luna! It was a 30 minute walk back to our hotel after arrival. 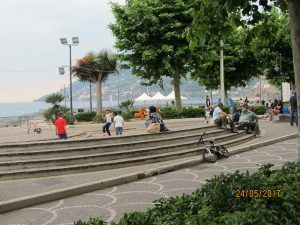 It is a very nice walk though along the promenade facing the ocean and there are lots of benches to take a break which we very much appreciated. We were back at the room by 6:00 PM. It had been a great and interesting day so far. It was also a great evening on the patio to relax for a couple of hours. The sun sets behind the hills around 8:45 PM, so lots of time to enjoy the nice evenings which we enjoyed very much! Life is Good! 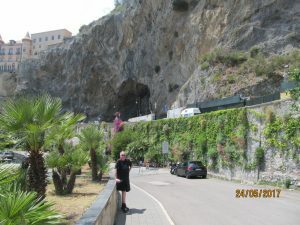 MK Enjoying the Walk Back Through Maiori & Our Boat ride Back! For dinner we walked down the oceanside walking trail in the opposite direction from the boat terminal. 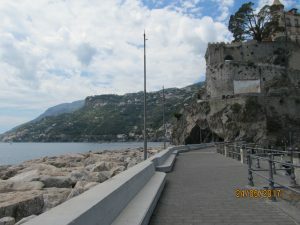 Only a 20 minute walk that way before the promenade ends at the town limits of Maiori. 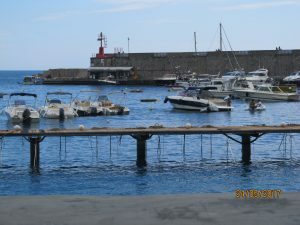 Ristorante Pizzeria Nettuno is right on the ocean at the Eastern end of the town of Maiori. This restaurant doesn’t open for dinner until 7:30 or 8:00 PM, depending on the day. Very varied menu like its opening times! The menu had lots of variety and again the locals appeared to be eating there, so Pizzeria Nettuno was our choice for dinner! On our Way to Ristorante Pizzeria Nettuno & the Views! We were seated at a very lovely table with a window view of the ocean. Hubby ordered some mussels and it was a very generous serving. I had a few and I thought they were good and I’m not a mussel lover. We then ordered a small pizza each, but they certainly weren’t small, at least medium or large I thought. So the portions are quite substantial here at Pizzeria Nettuno. Overall it was a good dinner for 40 Euros including a couple of large glasses of wine. The view while the sun was setting over The Almalfi Coast was worth the money for sure! It was magical and mystical to see the sun set over The Almalfi Coast especially as the mist rolled in from the ocean! It was a nice evening for a walk back to the hotel along the Palm tree lined promenade. 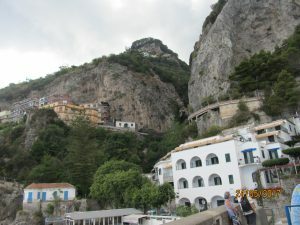 From this walk back we could see the lights of the elevators ascending the cliffs to the posh hotels that dotted the mountainside of Maiori. Places we could not afford but could only imagine! It was 10:00 PM before we got back to the Hotel Pietre and it was still very nice. So we sat on the patio deck and took in the amazing views of the surrounding hillsides that were beautifully lit and watched the lights flicker as the fog gently surrounded the mountainside! Time for bed! A new day tomorrow!